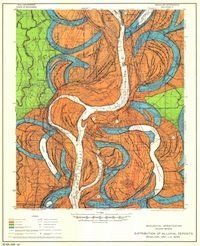 One of Fisk's beautiful maps of the Mississippi River, near Readland, Arkansas. Click the map to see more detail.Like most earth scientists I know, I love maps. As a child, I pored over the AA Atlas of Britain on long car journeys. As a student, I spent hours making my first geological map. As an orienteer I learned to read maps running through rhododendron bushes in the rain. As a professional geoscientist, my greatest pleasure is still producing a fine map. When I worked on the McMurray Formation of Alberta, my colleague came across Harold Fisk's incredible maps of the Mississippi River. These maps have to be seen to be believed, and for me they show how far computers have to go before they can be considered to have replaced paper. The effort and commitment is palpable. If I ever produce anything half as beautiful in my career, I will consider myself privileged. Even more marvellously, since they were made by the Army Corps of Engineers, they are all downloadable for free. No doubt I have missed some. If you have a favourite of your own, please add it to the comments or drop me a line and I'll be happy to post a follow-up.